In response to those who aren’t au fait with democracy it means that in the Referendum the majority of the voters of the UK voted to leave the EU. This was not a debating point for our MPs to discuss, it was an instruction for them to do that which they were told and are paid by us to do. Maria Caulfield, the Conservatives, and the ‘opposition’ Labour, representing some 83 per cent of those who voted in Britain in the last General Election, had manifestos which stated that they would carry out the instruction of the people and leave. Not one elected MEP from any country across the EU has any say in the political or law making processes of the EU, to believe otherwise is mistaken. Their token job is to rubber stamp ‘directives’ handed down by the unelected and anti-democratic EU Commission. There is a requirement in a democracy to have accountability, something which is clearly an alien concept to the EU. 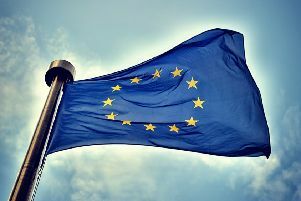 The EU used a German blueprint to create an economic and political empire based on a plan concocted by its chief architect Walter Hallstein, who played key roles in representing the Nazi government and Fascist party elites prior to and during the Second World War. Hallstein gave a speech in Rostock before the war setting out the aims of the Reich to annexe the lands of Europe for Germany by political and economic means. Amongst the ideologies he also promoted were the Nuremberg racial laws which stated that anyone not of pure blood was prohibited from marrying or having ‘relations’ with persons of German blood and excluded German Jews from citizenship. The same Hallstein became first president of the Union and signed the Treaties of Rome in 1957 by which time his affiliation with the Nazi party was conveniently forgotten. The image the EU presents is that of a benevolent union but in reality it is an unaccountable dictatorship. Any democracy requires an opposing party – the EU parliament has none. ‘The Single Market’ is, in reality, a declining oppressive protectionist racket which keeps prices high and therefore poor people poor. There is a need for openness and transparency in any democracy which is completely lacking in the EU and has been, in turn, severely eroded in our country by being associated with and subject to the ‘directives’ handed down from the unelected EU Commission. The EU is an opaque dictatorship and as such is not what it claims to be. It doesn’t better lives, it crushes freedom and democracy leaving people to live in penury – if you doubt that look at the poverty and rampant unemployment in Greece, Italy, Spain etc caused by the EU being fanatically determined to prop up the Euro and protect the EU’s banks and bankers at these people’s expense. I wonder how those that voted to stay in the EU might have reacted if the referendum result had been to stay in the EU and then their MPs decided to ignore them and that we should leave to gain freedom and control of our laws and country? There is everything right with the countries and people of Europe living freely as good neighbours in open and transparent democracy, trading freely with one another just like the rest of the world’s countries. Sadly, in reality, that is not what the EU is about.